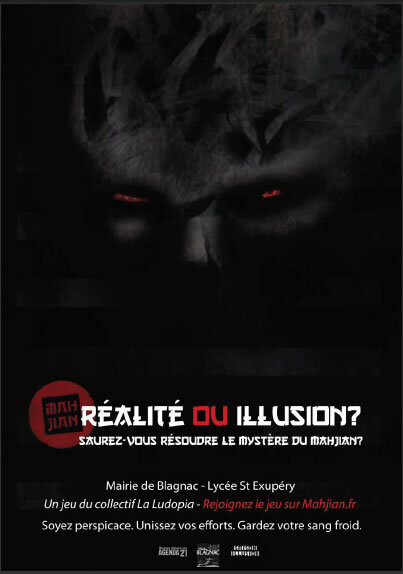 Mahjian is an "Alternate Reality Game" who took place during 6 month (from january to june 2011) in the city of Blagnac, France. Proposing puzzles to solve on Internet mixed with real-life treasure hunts throughout the city, alongside with a giant game-show as a closing event, this game was designed to promote the cultural activities of Blagnac city. "Blagnac. Mahjian, un jeu pour vous rassembler"
"Blagnac. Le jeu Mahjian lance les festivités de la ludothèque"